Units are shipped fully assembled and can be installed in minutes. Lower shelf sold as option. Top manufactured from 14 gauge, Type 304 stainless steel. Type 304 stainless steel, HD Super posts and proven Super Erecta construction throughout. Units are shipped knocked down to minimize freight charges and handling and can be assembled in minutes. 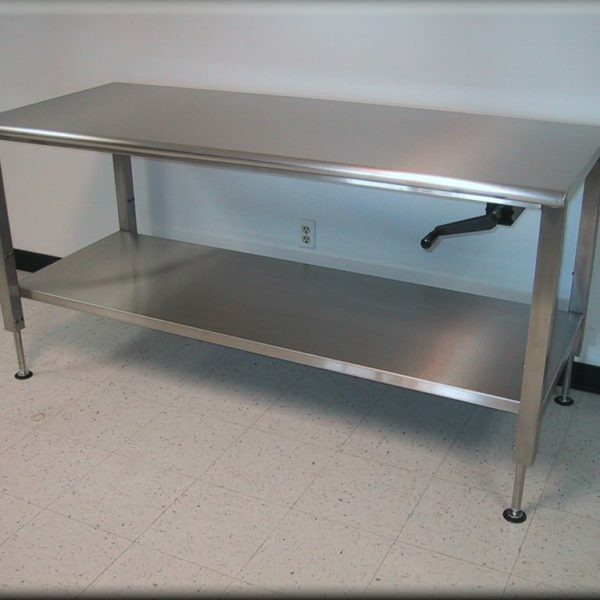 All rod and perf top tables feature height adjustable legs (33 to 40 in 1 increments). All tables with overheads have 74 high rear posts. Cantilever shelves are sold separately. Top manufactured from 14 gauge, Type 304 electro-polished stainless steel, with .75″ holes on 1″ centers. Support members have satin finish. Table provides approximately 35% open area. Top manufactured from 1/4″, electro-polished, Type 304 stainless steel rods with 1″ spacing. Table provides approximately 75% open area. 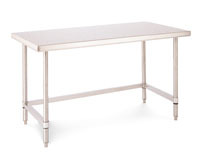 Built for cleanliness and stability, these tables feature a seamless 14-gauge, Type 304 stainless steel work surface, and plated support structure that virtually eliminates drumming. HD Super posts and proven Super Erecta construction throughout. Units are shipped knocked down and can be assembled in minutes. 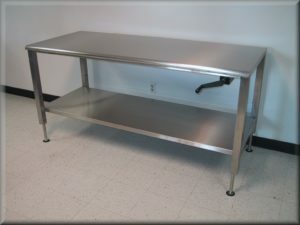 All Solid Top Clean Tables are 34 (864mm) high with stationary posts and leveling feet. 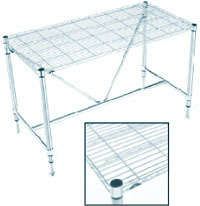 Type 304 stainless steel, HD Super posts and proven Super Erecta construction throughout. Units are shipped knocked down to minimize freight charges and handling and can be assembled in minutes. All rod and perf top tables feature height adjustable legs (33 to 40 in 1 increments). 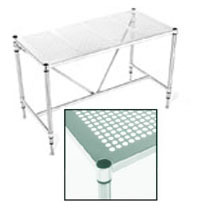 All tables with overheads have 74 high rear posts. Cantilever shelves are sold separately. Top manufactured from 1/4″, electro-polished, Type 304 stainless steel rods with 1″ spacing. Table provides approximately 75% open area. Support members have satin finish.